What Are "Seat Lessons "? One of the primary differences between dressage and other types of riding is that the dressage rider must accept more responsibility for his own body. Effective dressage riding requires a supple and secure seat such that the rider does not interfere with the horse. 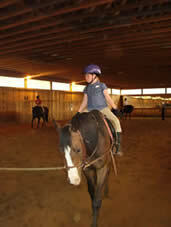 An unschooled rider easily loses his balance when a horse takes even one step. 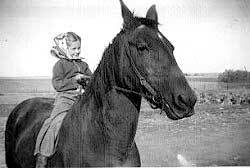 (That's the author to the right at age seven.) The rider’s first impulse is to steady himself with his hands - which are attached to the reins. (See above.) These - unfortunately for the horse – are attached to the horse’s mouth. Balancing on the horse with one's hands blocks communication. It numbs or aggravates the horse. From a long-term standpoint, it causes inappropriate muscle development in the neck of the horse. It causes the horse to develop a stiff back, which in turn makes the horse more uncomfortable and in fact more difficult to ride. In dressage, we want our horse to develop a soft back. We want our horse’s neck to reach for contact with the rider’s hands. This all requires that the rider be secure and balanced in the saddle. The United States Dressage Federation recommends that all riders take at least one seat lesson per week. Even professional horse trainers and accomplished riders develop stiffness in their own bodies that interferes with the horse’s movement. In a seat lesson the rider abandons his control of the horse. The instructor commands the horse via a whip and lunge line. The horse travels in a circle around the instructor. The student is free to concentrate solely on his position in the saddle. In a seat lesson we first work on the vertical alignment of the body. The shoulders are above the seat, the head above the shoulders, feet under the seat. Any tension in the body affects this vertical alignment. Many of us slump our shoulders and protrude our necks. Poor posture results in muscle stiffness, headaches and eventual skeletal degeneration. In seat lessons we strive to enable the upper body to balance erectly upon two sitting bones. Any muscle tension affects this balance. Hence it affects the rider’s ability to feel his sitting bones and to effectively utilize the weight of his upper body. The legs must hang loosely from these balancing sitting bones. Many different exercises are used to loosen the tension in the rider’s body and to enable the body to softly follow the movement of the horse. Seat lessons are fun! They are energizing! Your horse will thank you many times over. Do you want to sit on your horse like dead weight that the poor horse must drag around? Or do you want to sit like an almost weightless sprite that effortlessly commands every movement of the horse? More advanced seat lessons address transitions: the ability of the rider to maintain his balance, effectively use his upper body weight in transitions and to eventually use half halts to influence the horse’s tempo and length of stride. 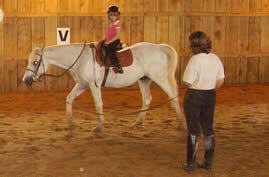 Almost all seat lessons are done without the rider holding the reins. Generally they are also done without stirrups. Don’t worry. There are many instructors experienced in controlling a horse on the lunge line and many horses that are experienced, safe and predictable for seat lessons. As one develops one’s seat (and one’s confidence! ), a more volatile horse can be used – thus revealing to the rider that the rider has developed the balance and confidence to sit even spooks and bucks with ease. Don’t know of anyone in your area who gives seat lessons? Come to Anchorage Farm. 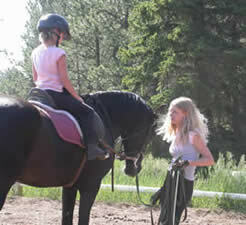 We will not only give you seat lessons; we will teach you how to properly lunge your own horse. Eventually you will be able to give seat lessons to others – and to teach someone how to give seat lessons to YOU! Am I too old to learn to ride? Are you ready for a warmblood? Calm your body. Calm your mind. Take riding lessons! Anchorage Farm is a bed and breakfast inn located in the mountains 20 minutes southwest of metro Denver near the Rocky Mountain foothill communities of Conifer, Bailey, Evergreen, Morrison, Golden and Pine, CO.